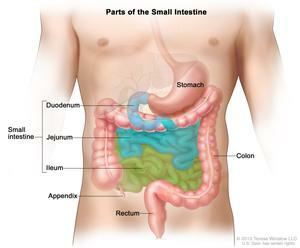 Inducing Crohn’s disease issues is easier than you’d think. You have to find a food that bothers you, and eat it, and you look for pain and inflammation. Simple as that. Knowing I had the Pill-Camera to look forward to on Tuesday, we planned on lasagna for Sunday night, because for month’s it has been a consistent problem for me. (See Another Week) And, without fail, issues occurred, and it ended up being my last meal until after I swallowed the camera. I was technically allowed to have food until Monday at noon, but my stomach was still hurting on Monday, much like most of my weekend, so I skipped on my last chance at food, and I regretted it by dinnertime. I was starving. Not only do you not get food, but after 8 PM you cannot even have liquids or water, and I was dying to have my bottled water at bedtime. Knowing I had to be at Good Sam at 6:30 AM, I got up at 4:45 to ‘get ready’. I know, that’s a long time, but I do my face, my hair, etc, etc, all WITHOUT coffee. I am slow in the mornings, so without coffee, I lollygag. This was the first time in a week that I had actually put on my ‘full’ makeup, and I had to get ready for Def Leppard, too, because I wouldn’t have a chance post-capsule. We got to Good Sam’s, and had to wait in their creepy waiting area, and I got to fill out forms with information. Then I got to repeat the information to the nurse, and then repeat it to Dr. H, with lots of questions in between. Like, Do I know what I’m having done? – Yes, Capsule Endoscopy – although nothing is being done. I swallow a camera, wear a fanny pack, and then return the equipment – the fanny pack and box receiver, not the camera itself. Do I have other insurance? – No, the VA is my sole provider. Considering this wasn’t my first time, I was an easy check-in for Good Sam’s, and I got the consult and camera pretty quickly. With no problems other than Crohn’s Disease, the capsule was approved and I finally got to have a glass of water. I am rather upset at myself for not waving ‘Hello’ to my doctor before swallowing the camera, and I’m sure Dr. H would have found it funny. I know I would. Capsule endoscopy #2 Pill camera endoscopy. Mary Horsley. And, 8 hours later, I got to return the equipment. By this point, my hips are hurting from wearing the heavy belt all day, and my neck starts to get bothered having something rubbing on it all day. You find yourself constantly adjusting everything, but never being comfortable. You can’t move ‘too’ much, for fear of lodging the camera inside into a funny position. The last thing I needed was a bowel obstruction to add to my day. The good thing about outside appointments? I usually get results quicker than the VA would provide. It was literally 24 hours and I was already receiving a call from Dr. H. This is the type of care I expect! 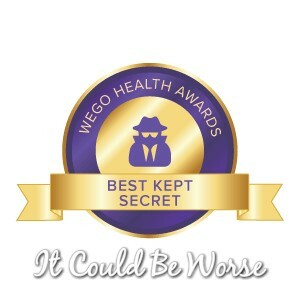 But, Dr. H was not just calling about my results, she was calling to schedule me an immediate x-ray because she was worried about the pill-camera getting stuck, because of my multiple ulcerations in my small bowel and repeat images in the capsule endoscopy video. It’s pretty bad when a doctor calls you worrying about your issues. I had to tell her that the camera made its reappearance with NO BOWEL OBSTRUCTION. Hallelujah! According to the Capsule endoscopy, I had multiple ulcerations that would explain my bleeding fits, my stomach pain, and my issues. 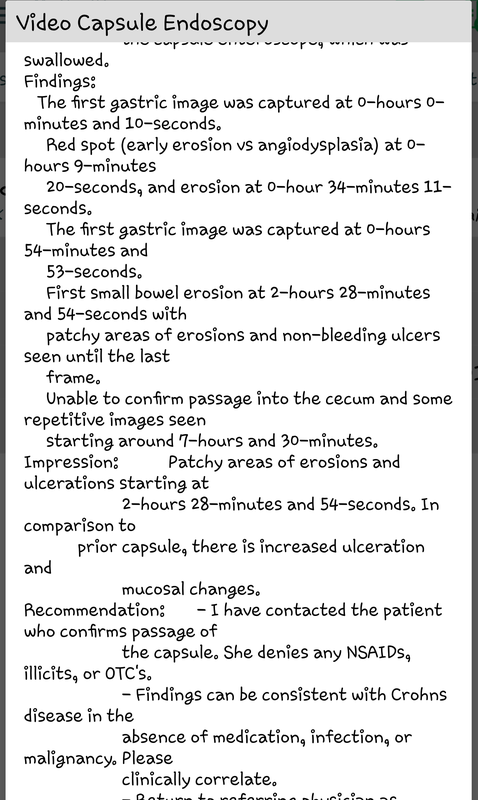 Capsule endoscopy 2 shows us that there are early erosion’s in my upper stomach, with an increase in ulcerations and mucosal changes compared to Capsule endoscopy 1 from 5 months ago. This Capsule endoscopy helps to show more erosion’s and ‘patchy’ areas, consistent with Crohn’s disease in my small intestine, specifically my Ileum. It’s so bizarre there are numerous spots of inflammation shown with the capsule, but none of my blood tests, samples or scopes have shown issues. When I tried to call Dr. R, my GI doctor who I just visited and who scheduled the capsule, I was told he had ‘just graduated’, and that he would no longer be my doctor. Go Figure, I get to begin again. So, I was placed with a new doctor, Dr. Wolf, who should be available at the VA for 3 years. I will have a new consult with her on August 25, the soonest appointment available, to discuss medications, the capsule, and the Double Balloon endoscopy. Hopefully I will have scheduled the Double Balloon endoscopy procedure by that appointment, and hopefully, I can be put on the new medication for my issues. But, that’s another month away, and another month that I get to deal with my issues without relief. Ugh. For our Infertility Journey this week, See Is ALL Hope Lost, Again? Check out Pinterest and our Facebook for daily updates! good luck to you my dear. how are you now? im going through same thing. i enjoy your writing. Great! I had a really bad year but I am seeing a great nutritionist Dr. Grovit. He has put me on a strict diet and has me on probiotics and an herbal supplement. I am seeing improvements for the last two and a half months.